ADAM Jamieson ended a 10-year association with Mornington when he resigned on Saturday morning. The news rocked the Dallas Brooks Park outfit as it prepared to do battle with visitors South Springvale in their State 1 South-East fixture. Jamieson cited work commitments as the principle reason for his departure. “I have a lot going on with business and I can’t give Mornington 100 percent commitment anymore,” he said. “It’s been my second home for a long period but I just knew that my time had come. Jamieson, 41, played with Skye Rovers and Frankston United as a junior and his senior career involved stints with Caulfield City, Springvale City and Frankston Pines. Injury ended his career when he was 23 and he switched to coaching at Frankston Pines, the senior club he’d played for the longest. He assisted Stan Webster and Craig Lewis until the latter took up a job offer in Dubai part of the way through the 2006 Victorian Premier League season. Jamieson stepped into the breach and although Pines were relegated they bounced straight back the following year by winning the Division One championship in Jamieson’s first full season as a senior coach. 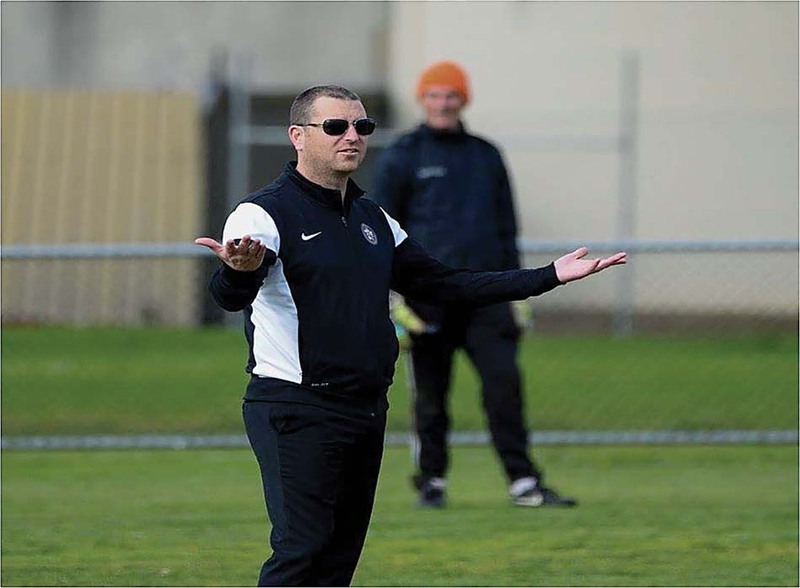 He left Pines after seven games of the 2008 season and in 2009 took over the reins at Mornington taking the club from Provisional League to the verge of NPL ranks and winning State 1 championships in 2015 and 2016. “It’s a really sad day for the club,” Mornington president Matt Cameron said. “Adam’s been much more than a coach, he’s been my best mate and he’s a legend here so Saturday was a very emotional day for all of us. Assistant coach Dale White took charge when Mornington comfortably accounted for South Springvale 3-0 last weekend. So far the season has proven to be a pointless exercise for the visitors and their cause wasn’t helped when Sammy Orritt converted from the penalty spot in the 17th minute. Veteran striker Wayne Gordon scored twice in the second half, the first from a long ball by keeper Liam Little which sent Orritt down the right and his cross to the far post was headed in. Orritt also was the provider for Gordon’s second which sealed the issue. In NPL2 news Langwarrin defied the odds to defeat North Geelong 3-1 at Lara’s Elcho Park on Saturday. Injuries had decimated Langy’s defence with Luke Burgess, Andy McIntyre and captain Boris Ovcin all sidelined along with suspended midfielder Mat Luak. Viktor Medini lined up at right back with Jon Guthrie at left back and Dylan Kilner made his NPL debut alongside Andy McLean in the heart of defence. North Geelong had dumped Langy out of the FFA Cup in late March and went into the contest expecting a win. But the Croatian-backed club didn’t reckon on two smash-and-grab goals from Liam Baxter in the 34th minute and Callum Goulding in the 42nd minute that gave the visitors a 2-0 half-time lead. Langy went further ahead when big Sam KIepac controlled the ball on his chest then volleyed home to make it 3-0 in the 58th minute. North Geelong hit back through Ryan Opperman two minutes later but a man-of-the-match performance from Kilner and some outstanding saves from Langy custodian Robbie Acs gained a valuable three points for the visitors. In State 2 South-East news both Frankston Pines and Peninsula Strikers suffered 3-1 losses away from home to Knox City and Mooroolbark respectively. A Jordan Avraham overhead kick put Knox ahead in the 19th minute of their clash with Pines but the visitors levelled in the 39th minute when CJ Hodgson was brought down by Knox keeper Colin McCormack and converted from the spot. Former Pines striker Matthew Hames made it 2-0 in the 58th minute when he charged onto a long ball and lobbed Pines keeper Jarrod Nardino and Hames’ second goal in the 81st minute ended Pines’ resistance. “I think a few people got intimidated even before we kicked a ball,” said Pines gaffer Paul Williams. Strikers started the season eyeing promotion but find themselves in the relegation zone after four losses in five games. Sean Perrin (17th minute), George Aratzis (65th) and Ross Clark (69th) scored for previously winless Mooroolbark while Ryan Thompson (61st) scored for Strikers. Saturday’s State 3 South-East derby ended in a 3-1 home win for Skye United over Seaford United. Seaford surprised its opponent with a superb strike from just outside the area by Adrian Pace in the 37th minute but a Cam Leopold effort from 30 metres dipped and swerved past Seaford keeper Ugur Erdem a minute before the interval. A sweeping Skye move five minutes into the second half involving Marcus Collier, Jason Nowakowksi and Caleb Nicholes ended with a first-time Nicholes shot which Erdem did well to block with his feet. The deadlock was broken in the 69th minute when a superb chip from the right of the area by Daniel Attard picked out an unmarked Nicholes who headed home at the far post. When Nicholes was allowed time to chest the ball down then turn and strike a low shot into the far corner in the 75th minute the contest was over. Seaford huffed and puffed but desperately needs striker Dylan Waugh back from suspension and although Skye will be content with three points it will need to improve if it is to mount a serious promotion campaign. Meanwhile Baxter lost 3-0 away to Hampton Park United in their State 4 South clash on Saturday. A forgettable first half was followed by a controversial second period. In the 65th minute an attempted clearance by Heath Goss cannoned off Hampton Park’s Ahmad Suleiman for the opener. In the 75th minute Peter Otto was allowed to continue from an offside position and although Baxter keeper James Foster did well to parry Otto converted the rebound to make it 2-0. Baxter boss Francis Beck was livid and his protestations earned him a send-off. To make matters worse the same linesman again failed to flag in the 88th minute when three Hampton Park players were offside and Nicholas Marcinkowski was able to waltz past Foster and make it 3-0. In NPLW news three of Southern United’s under-age teams played against Bayside United at Kingston Heath Soccer Complex on Saturday. The under-12s drew 2-2 with Southern’s goals coming from Rhiannon Kelleher and Kayla McLeod while the under-14s won 2-1 with both goals scored by Candy Kilderry, the first from the penalty spot. Southern’s under-16s staged a remarkable comeback to down Bayside 3-2. Southern was 2-0 down but two goals from Jas Ristevski and a Haylea Porter goal turned this contest on its head. Southern keeper Rianna Tann played a crucial part in the victory with an outstanding save at 2-2. Southern’s under-19s and seniors took on Bayside on Sunday. FRIDAY 8.30pm: Collingwood City v Skye Utd (Kevin Bartlett Reserve). SATURDAY 3pm: Langwarrin v Altona Magic (Lawton Park), Morwell Pegasus v Mornington (Ronald Reserve), Frankston Pines v Berwick City (Monterey Reserve), Seaford Utd v Monbulk Rangers (North Seaford Reserve), Sandringham v Baxter (R.J. Sillitoe Reserve), Somerville Eagles v Bunyip District (Tyabb Central Recreation Reserve). SUNDAY 3pm: Peninsula Strikers v North Caulfield (Centenary Park).